Antonio de Padua María Severino López de Santa Anna y Pérez de Lebrón (21 February 1794 – 21 June 1876), often known as Santa Anna or López de Santa Anna, was a Mexican political leader, general and President who greatly influenced early Mexican and Spanish politics and government. He first fought against the independence from Spain, and then supported it. He rose to the ranks of general and president at various times over a turbulent 40-year career. He was President of Mexico on seven non-consecutive occasions over a period of 22 years. Santa Anna boldly signs this extremely graphic bond. It is without doubt the most impressive and ornate of all autographed stock or bonds. 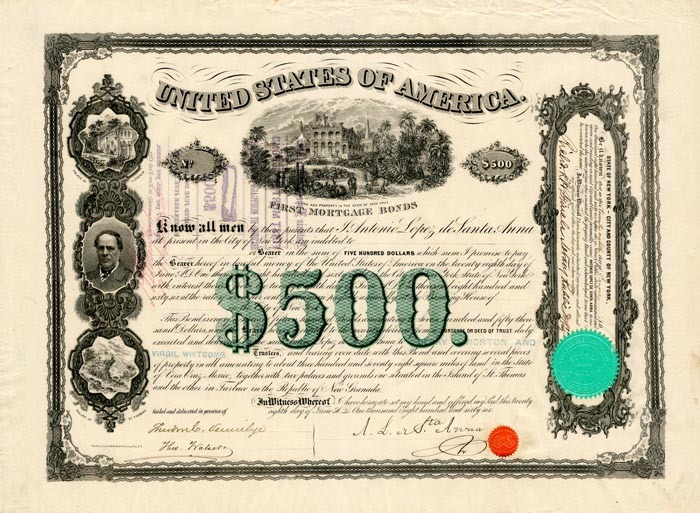 This $500 bond was issued in 1866 from New York City while Santa Anna was living in exile. While he schemed to depose Emperor Maximilian, he issued these bonds in hopes of regaining power. In these attempts, he was captured and sentenced to death. Still, he was released and allowed to retire to New York and later when blind, he died in poverty and neglect. Of course, we remember him because of his success over the Texans at the Alamo and later his defeat and capture by Sam Houston at San Jacinto in 1836. Found in an old leather container in Texas, this Santa Anna signed American bond is fully issued, uncancelled, has no folds, has full margins and is in Superb condition.